Ferrari boss Amedeo Felisa has said the firm will ”never” follow rivals Aston Martin and Porsche into making a four-door sports saloon. When it was put to Felisa that once upon a time Ferrari would not have made a hybrid vehicle or had fuel-saving stop-start technology on its cars – two things it is working on now – he said: “Hybrid was forced on us by regulation, there is no regulation forcing us to do four doors. “Frankly speaking no-one is asking for a four-door Ferrari. If you want a four door Ferrari we have a Maserati. 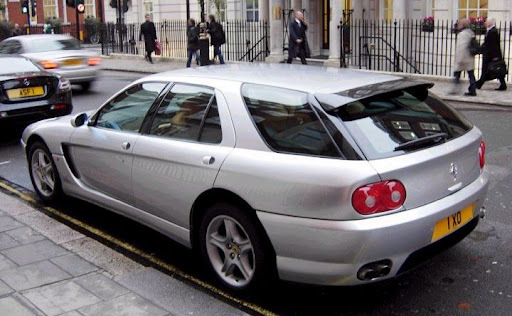 Hate to call Amedeo Felisa a traditional liar or a classic fibber but Ferrari has created a few four door models for the Sultan of Brunai including 456GT sedan and estate. http://www.autozine.org/Misc/Article/brunei/Sultan_garage.html Let poor Enzo rest in peace already and put the fake indignation in the grave with him. Now, this is clearly platform-sharing at its best: making more bodystyles, with more practicality, without sacrificing elegance, style, performance or handling. Come on, Ferrari, get your heads out your arses, sack whoever styled the 458 and get back to producing cars like the 456, 4-door models and all. That red 456 sedan is hideous! The estate however is pretty nice. There is a major difference between one-off specials for VIP customers like the Sultan of Brunei and series production. Ferrari also had the Pinin show car in the early '80s. The Sultan also commissioned three copies of the Mythos show car from 1989, but again the car never appears in Ferrari production records. Ferrari don't need to make a 4dr saloon, their new desigs- the 458, the F599 look wonderful, not sure about the California but it isn't too bad either. The cars for the Sultan of Brunei were not done by Ferrari but by Pininfarina. A small but crucial distinction. Ferrari don't need to make a 4dr saloon, their new designs - the 458, the F599 look wonderful, not sure about the California but it isn't too bad either. The California is just a Maserati in drag, the 458 is uglier than a cancerous tumour, the 599 is plain porky, and unbalanced with it (it's way too wide and those buttresses at the rear, combined with the upright rear 'screen completely upset it), and the one you didn't mention, the 612 Spaghetti, is not only porky and too wide, but piggy-eyed too. Can't understand where you got your taste from. Come on, Ferrari, let's see more of the spirit of the 250, the 275, the 330, the 365 (including the Daytona), the 308, the 456, the 355... all beautifully elegant cars. Ferrari have really lost their way. Weirdly, right now, I'd much rather have a Porsche 911 than a Ferrari 458.